What do you do when you’re second last to join the party? Everyone else has been there for hours. Some even from 5 o’clock. So how do you suddenly become life and soul? For the small SUV shindig, Ford made its Kuga best to drive. There are gimmicks, of course. 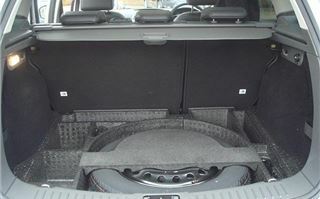 Including a hatchback within a hatchback, so you can fill the load area with Tesco’s bags without smashing the eggs when you slam the back shut. And you get rear picnic tables for the kids to collapse their MacDonald’s fries and cokes onto their laps. But apart from that it’s a proper Ford. 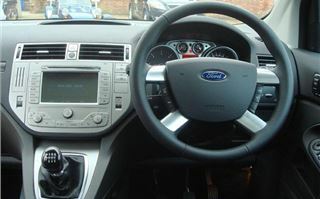 Which means, like the Focus and Mondeo, it sets a new class standard for ride, handling and feelgood factor behind the wheel. Instead of something cheaper and nastier, Ford has adopted the expensive and extremely well proven Haldex centre clutch, as used by Audi in its quattro systems. Under the bonnet you get the latest, improved, Dagenham built, 2.0 ‘Duratorq’ TDCI 136 engine, which Ford now makes for Peugeot, Citroen and Volvo. And which, significantly, chunders out a mere 169g/km of CO2, less than any other diesel SUV apart from the Nissan Qashqai 1.5DCI, and which means £170 tax this year and £175 next year. No 4x4 penalty there. Torque arrives at the party with 240Nm from 1,500rpm, increasing to a maximum of 320 at 2,000rpm, tailing back to 240Nm by 4,000rpm, the point of maximum power. So there’s plenty where you need it. The Kuga does 0-60 in 10.2 seconds, tops out at 112mph and is EC certificated to manage 44.1mpg combined. 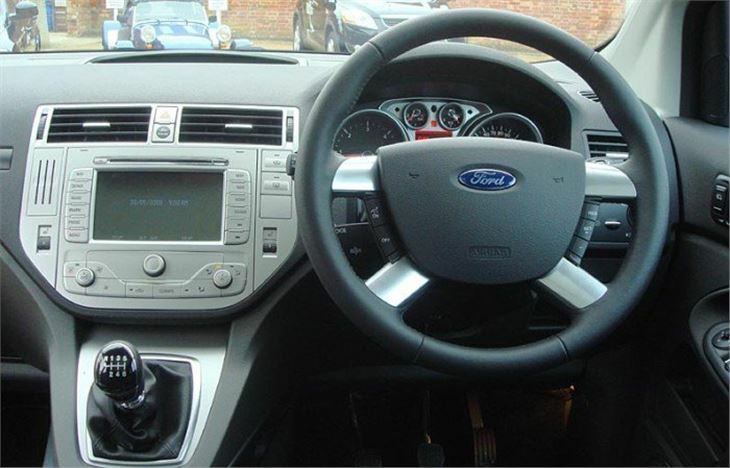 There are just two ‘specs’: Zetec and Titanium, with plus packs to add more leather, or two different types of satnav and other goodies that can jack the price up from £20,500 to around £27,500. I’ve no idea what it’s like off-road. Possibly average. Certainly worse than an X-Trail or Koleos or Freelander II. And, of course, that isn’t the point. This is an urban warrior SUV, not a country cousin. 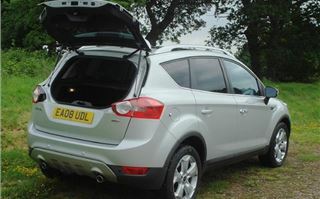 95% of the people who buy it will never venture further off road than parking on the grass at a car boot sale. 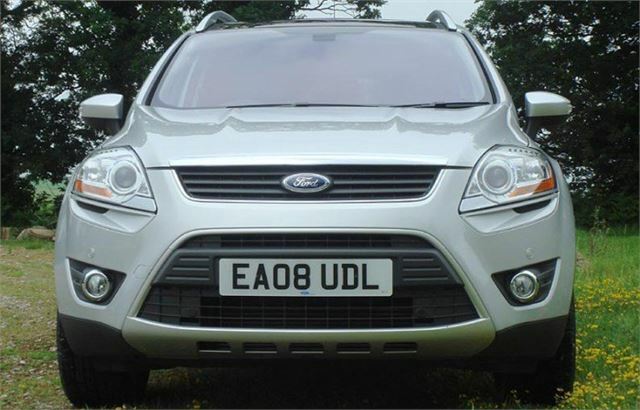 Driving it, apart from being able to see over some hedges, you’re almost unaware you’re in an SUV. There’s almost none of that heavy roll understeer that weights up the steering and can have you wondering if you’ll actually make it round a bend. Obviously it’s not quite as crisp as a Focus. But as long as you don’t lose commitment, it uses the additional drive to give you grip and tighten the car’s line out of a bend, just like a good quattro does. 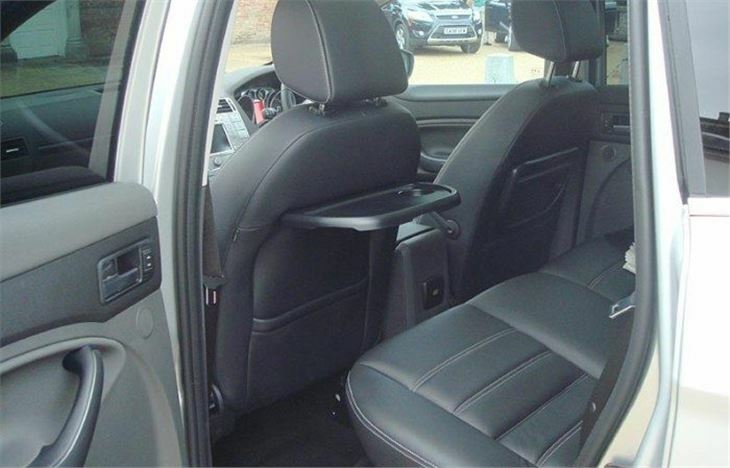 It’s an SUV you could comfortably drive quite quickly every day without getting irritated by its handling quirks. The 450mm (18”) wading depth will come in useful if you’re planning a move to Gloucestershire. And the trailer towing limit of 2,100kg, 100kg higher than the class average, will help if Dobbin starts putting on a bit of weight. Average consumption of four Kugas tested by different drivers varied from 33.5mpg to 45.8mpg, compared to the EC Urban and Combined figures of 34.9 and 44.1mpg. It’s worth specifying the optional £50 tyre deflation system because that gives you the choice of switching to runflat tyres when the first set wear out. 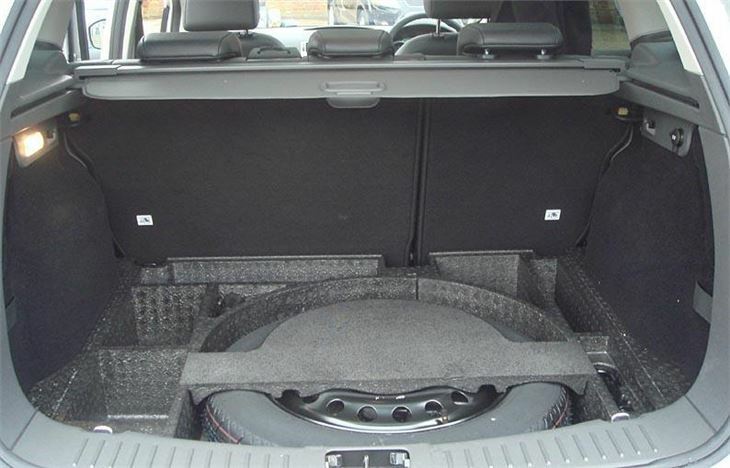 You can then do away with the space-saver spare and free up a lot of additional loadspace under the rear load floor. 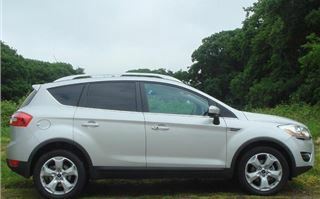 The Kuga’s most obvious lifestyle competitor is the VW Tiguan, for which, for some versions, there is now a waiting list. The Tiguan probably beats the Kuga off road. But on the road the Tiguan is too stiff. VW keeps trying to copy Focus handling characteristics, yet the closest it has got so far is the Golf Bluemotion, on small wheels with deep profile tyres. 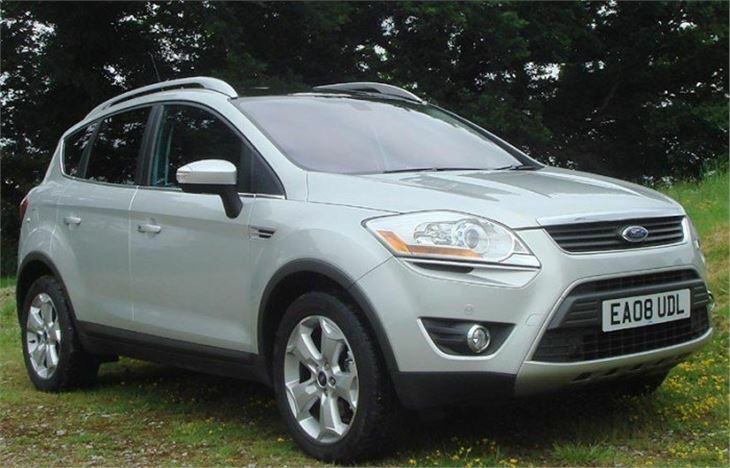 The Tiguan is just hard, and, once again, with the Kuga, Ford shows how it should have been done. It’s biggest problem is the snobbish British class system that still rates VWs as somehow superior to Fords even though they have tailed the blue oval in terms of ride, handling, build quality and reliability for at least 10 years. Yet, somehow, once the Kuga starts appearing on streets, especially picking kids up from school, unblinkered eyes are going to start noticing the handsome newcomer and more than a few aspiring housewives are going to start wondering if a Tiguan really is the way to go. For prices, specs, dimensions and performance figures, please click the tabs.